Acanthostega is an aquatic organism with gills. It is estimated to be 360 million years old. As a result of the research conducted by Jenny Clack, a paleontologist at the Cambridge University in 1987, it was suggested that this fossil, having one limb and eight digits, was allegedly a transitional form between fish and tetrapods (four-limbed land vertebrates). Based on this claim and the fossil, evolutionists allege that fish first developed limbs and then made a transition to land, rather than moving over to land and then developing feet. However, this argument is totally inconsistent. First of all, Clack clearly states that she does not know whether Acanthostega was living on land or not, even though she is an evolutionist. It is a grave misconception to claim that an aquatic organism is a transitional form that supposedly came from water to land due to some bone-like tissue in the fin. This mistake of the evolutionists shows that they have quickly forgotten their misconception of the Coelacanth that lived 65 million years ago. The evolutionists portrayed the Coelacanth as a transitional form until the end of the 1930s. It was claimed that the bones in the fin of the 200-million-year fossil had transformed into limbs and could sustain the weight of the fish when it moved to the land. However, it was found out in 1938 that the Coelacanth was still living and the evolutionists were surprised. When the Coelacanth caught by the fishermen off the shores of Madagascar was examined, it was seen that the animal had not undergone any mutation for 200 million years and it was a bottom dwelling fish, let alone moving to the land. Furthermore, the organs interpreted by evolutionists as primitive lungs in the fossil were fat sacs. The Coelacanth was also caught several times after this date. Eventually, evolutionists had to stop claiming that the Coelacanth was a transitional form. As seen in the example of the aforementioned Coelacanth, aquatic creatures like Acanthostega, which have bones, are shown as transitional forms not because they have the structure to live on land but due to the prejudice of the evolutionists. According to the news in the journal Nature, a team of researchers from Uppsala University in Sweden, the European Synchrotron Radiation Facility (ESRF) in France and the University of Cambridge in the United Kingdom decided to carry out a detailed search in the bones of the humeri -the bones of the forelimb- of the fossils of the 360 million-year-old Acanthostega. In the search, the limb bones of the fossils were examined by using high-resolution synchrotron X-ray scanning (a circular accelerator used for the acceleration of charged particles into high energy). 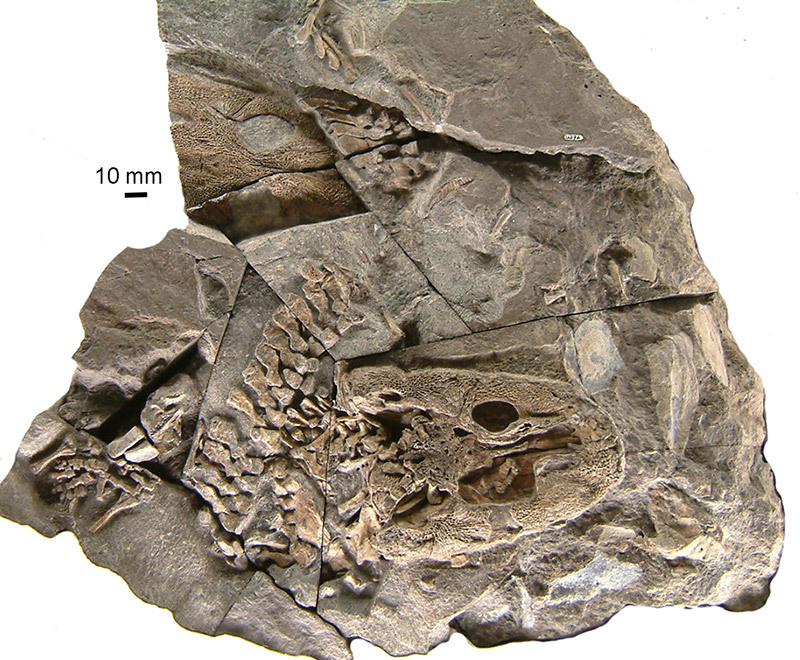 By means of this, the fossils of Acanthostega fossil underwent a very detailed analysis without being damaged. The microscopic structures in the bones of these fossils of the Devonian times (419-359 million years ago) were almost perfectly preserved. The X-rays used throughout this analysis revealed an important fact about this aquatic creature, the Acanthostega: The forelegs of Acanthostega were cartilaginous which provided a significant scientific proof that it was not a transitional form between fish and the tetrapods since cartilage is a non-mineralized tissue and it is flexible. Therefore, it is far too weak to allow the forelegs to sustain the weight of the animal’s body out of the water and allow it maintain life on land. That is why this scientific fact makes it physiologically impossible for Acanthostega, an animal living in the sea, to be a so-called transitional form that would move from water to land. As we can see, the studies carried out by evolutionary paleontologists across the world have only ended in failure and the missing links they search for cannot be found in any way. All this clearly demonstrates that an evolutionary process has never existed. 1. Weight bearing: Sea-dwelling creatures have no problem in bearing their own weight in the sea. Their body structures are not intended to such a function. However, most land-dwelling creatures consume 40 percent of their energy just in carrying their bodies around. However, for any aquatic creature to make an alleged transition to land, it would have to develop a totally different musculature and skeletal system to take on a load-bearing function. It is unfounded to claim that such complex structures could arise out of random mutations. 2. Heat retention: Temperature changes very quickly and at a large scale on land. A land-dwelling animal’s metabolism is capable of withstanding under such drastic temperature differences. On the other hand, temperature changes occur only slowly in the sea and this difference is not extensive as seen on the land. A living organism with a body regulated according to the essentially constant temperature of the sea would need to acquire a protective system to ensure minimum harm from the temperature changes on land. It is preposterous to claim that a fish acquired such a system by random mutations as soon as they stepped onto land. 3. Use of water: As an indispensable need for all living beings, water is at a meager supply on land. For that reason, water and even moisture need to be used economically. For instance, the skin has to be able to permit a certain amount of water loss, while also preventing excessive evaporation; that is why land-dwelling creatures experience thirst, something that sea-dwelling creatures do not. For this reason, the skin of sea-dwelling animals is not suitable for a non-aquatic habitat. 4. Kidneys: Sea-dwelling organisms discharge waste materials, especially ammonia, by means of their aquatic environment. But water should be used at minimum level on the land. Therefore, terrestrial animals have kidneys. The kidney is mostly a device for maintaining water balance in the animal by transforming ammonia into urea, which uses minimum amount of water in its excretion. Therefore, in order for the so-called passage from water to land to occur, those animals not possessing kidneys would have to develop a kidney system all at once. 5. Respiratory system: Fish ‘breathe’ by taking in oxygen dissolved in water that they pass through their gills. They cannot live more than a few minutes out of water. In order to persist their lives on land, they would have to acquire a perfect lung system all of a sudden. It is absolutely impossible that one animal can go through all these physiological changes as a result of mere coincidences and do so instantaneously. It is not possible for the evolution theory to overcome all these obstacles or provide scientific evidence for the mentioned allegations. The claims of a so-called transitional form can never go beyond mere speculation based entirely on imagination. European Synchrotron Radiation Facility. (2016, September 7), ScienceDaily.